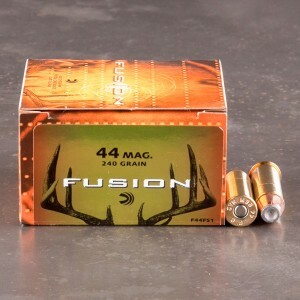 Soft point 44 magnum ammunition is one of the superior hunting loads available in this caliber. The soft lead tip is partially jacketed by a copper case. Soft point bullets are designed to maximize penetration, while allowing for some expansion and deformity. That allows these to be a good ammunition for hunting both medium and large-sized game. The semi-jacketed ammunition allows for more penetration that a hollow point, but deforms and mushrooms creating a larger wound channel. A soft point, or "sp" round, does not expand as much as a hollow point, but this is often desirable to achieve more penetration and reach vital organs. 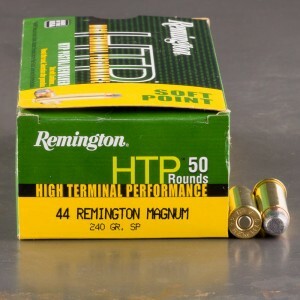 Soft point ammunition also feeds more reliably than hollow points in semi-automatics like the Desert Eagle and Coonan 44 Magnum. 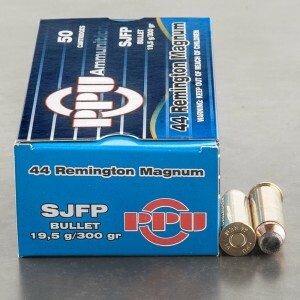 This ammo is some of my favorite .44Mag ammo because it burns clean, is loaded to .44mag specs, is very accurate, and that truncated cone soft point... it makes for one of the very best do it all loads for the caliber. Whether hunting, using this load for protection in the woods, or for self defense; this round stacks up really well. 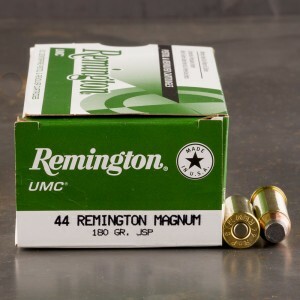 This ammo is full powered, hard hitting, an more than accurate enough to pop a black bear, mountain lion, hog, etc... It's my woods carry load in Highlands NC at the family Mountain home where we have several bear that have gotten more than cozy with our home, up close, and personal... This flat point bullet hits extremely hard and tracks strait thru pelt, and flesh with high velocity to shatter bones and keep plugging right along, yet still retains control-ability for follow up shots . It's overkill for "Around-Town" carry though. For that, the 210grain Gold Dots in .44Special (also sold here @ ATG...)are perfect for 2 legged predators. But this 300grain, semi-jacketed, Truncated Cone bullet, is superb and just the ticket for "Woods-Carry." 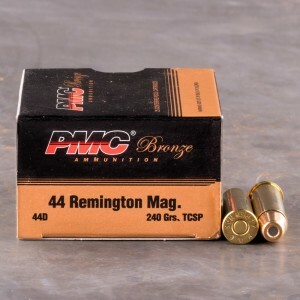 This is some dam good ammo, what the big deal for me with ammo by anybody is that it go bang when the trigger is pulled with no misfires. This ammo does just that.